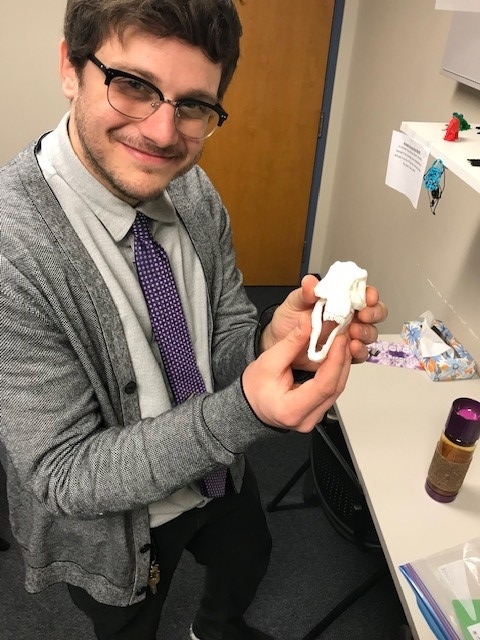 Ethan Milner, our Center Point School Therapist (and in-house 3D printing expert) recently made a generous donation of an additional 3D Printer, doubling the printing capacity of one of the cornerstone learning technologies used in Center Point’s “MakerSpace” studio. Ethan posing with the skull of a full model dinosaur a student is currently working on printing. 3D printing is a process of taking or making a digital 3D model and turning that digital file into a physical object. The technology has been used for decades in fields like jewelry, footwear, industrial design, architecture, engineering and construction, automotive, aerospace, dental and medical industries, geographic information systems, civil engineering, and many others. Schools across the country are using 3D printers as a powerful learning tool. Just about every subject within a school curriculum can benefit from the incorporation of 3D printing technology. Whether the subject is art, history, or science, a 3D printer can provide a platform for youth to think creatively, problem solve, reinforce STEM (science, technology, engineering, math) education, invent to learn, and develop pathways to career success. Printed replica of a real mammoth tooth! You may be wondering, how did the school therapist come to take on the role of the 3D printing specialist? Ethan explained that when Center Point received the first printer a few years back, it made sense for him to take on the role since he has more flexibility in his schedule than the teachers and family services coordinator. He admitted that it took him a few years to hone in on the various coding and programming skills needed to master the machine; 3D printing is very complex! Printed artwork by Center Point students. 3D printing is a particularly promising teaching and therapeutic tool for youth who experience social, communicative, or cognitive difficulties. Many of these students tend to be gifted visual, spatial, and tactile learners. The process of turning abstract concepts into concrete objects kids can interact with allows students to build self esteem, leverage their strengths, focus on their talents, and develop a skill set that could lead to potential employment. Because of the complexity of the process, 3D printing can be very frustrating for students. 3D printing provides an excellent therapeutic opportunity in which students can work through anger and frustration, problem solve, and overcome adversity. Moreover, as participatory design technology tools like 3D printers are connected to STEM industries, their presence in school, especially among students who learn differently, helps support an interest in and preparation for careers in promising STEM promising fields. A big thank you to Ethan for donating a New 3D Printer to Center Point’s MakerSpace, and most importantly for the important work you do daily as the School Therapist and 3D printer expert at Center Point!